Probably one of the more noticeable ads came from the NSW Electoral Commission and their election awareness campaign. Shades of the ACT Recycling Campaign though, so noticeable but not noteworthy. On the social side it was much the same as TV – throw buckets of money at everything and hope that something works. There were no stand out performers here, sadly, but the smaller parties and independents are doing a nice job of engagement on the social platforms which the larger parties struggle with due to a high level of trolling. John Barilaro showed that the Nationals are finally putting as much money into digital as the other major players. There were some nice efforts on social media, some great images shared which really helped drive resonance towards some MP’s, but again not integrated more broadly with a cleaner, narrative driven campaign telling a decent story. Lots but to cut to the chase running the dual prong strategy of positive messaging with negative messaging is never going to work. It doesn’t for commercial brands and it certainly never does for political ones. Sadly we will see a positive and negative message placed in the same break in the federal election thanks to the Hot Hand theory. Then there is the information dump that is negative advertising, which screams “only shown to a select bunch of party officials in a room closed off to all other distractions and not as how a punter would see it”. No one is ever going to remember a 4, 5 or 6 point plan or the myriad ways someone else has been evil whilst in government/opposition. And I’ve done the research to prove it. This is the visual era and the most powerful negative message during the whole campaign was a video taken of Michael Daley saying words he would regret. Truly the negative advertising is getting worse. It might be easy money for an agency out there but the messaging needs to be far better. Probably more of the same. Politicians truly believe that everyone reads or watches their ads because they do. Nonsense. I have been told by politicians about how much they love negative advertising and how effective they think it is. Yet as far as I know in Australia there has been little research to support it and a Facebook poll I helped with in 2016 found 85% of respondents hated it. I’d be surprised to see that those numbers had changed. Sadly Clive Palmer’s campaign seems to back up what may be coming down the NBN in the months ahead. Positive messaging first up, perhaps the odd dab of the good ol’ SMS with a click bait link, followed by the negative media carpet bombing raid, interspersed with some social media standouts that keep the whole campaign from sinking under the weight of the advertising work. 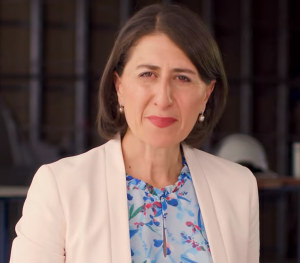 The stand out campaigns in this NSW election have come from the minor parties and the independents, and you can expect the same to continue in the Federal campaign when it kicks off. But I do so hope that I’ll be proven wrong. Dr ANDREW HUGHES, a specialist in political advertising, is a lecturer in marketing in the Research School of Management at the ANU. 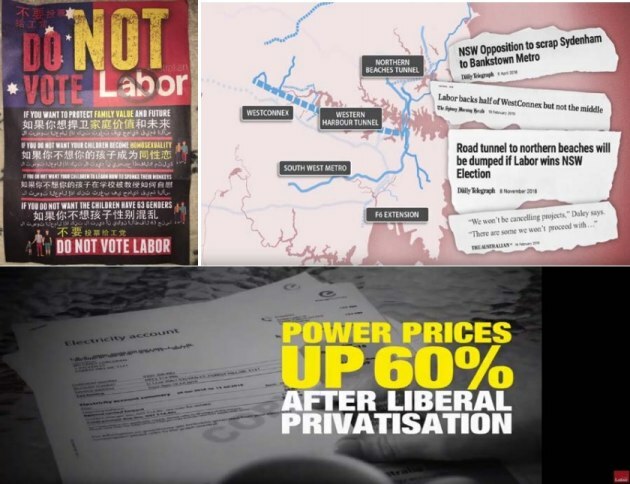 Sadly something seems to have gone a bit missing in the NSW state election campaign when it comes to political advertising. Maybe it's creativity, ideas, or the touch of a master political communicator such as Ted Horton or the late Neil Lawrence. It could also be that the same old playbook has been dragged out of the election advertising drawer, had the dust blown off, and then used. The strategy should be familiar by now – the positive, followed by the negative information cluster bomb information attack, rounded off with the social campaign and the dark messaging which falls outside the election laws written when Paul Hogan could still paint the Harbour Bridge. The political advertiser has no easy task. Fighting hugely negative attitudes towards both brand (party and politics), and advertisement, they need to in the space of four weeks move someone from awareness to voting behaviour. With little support from anything else marketing wise, a political ad is tasked with carrying far too great a weight on its shoulders and is the primary delivery weapon for a campaign, superseding candidate, party and usually policy in creating the value offering. It is the front line of the campaign and usually the only experience a voter gets with a brand, and the only chance a brand has to deliver a clear and concise narrative to the voter in the street. Little wonder then that those who have worked on a political advertising campaign say that it gives them skills and knowledge about advertising campaigns in general which last for decades. And this all happens in the context of 2019. An information intensive environment where mastery of the five second YouTube ad is becoming a necessary requirement of the modern advertiser faced with a consumer engaged with multiple platforms and devices all at the same time. Never before has capturing attention been so difficult, let alone keeping a message in the voter’s memory. Keep this in mind for the federal election, now only a matter of weeks away. Not much really. Nice use of animation and graphics by the Shooters, Fishers and Farmers party their TVCs, and they largely kept the message positive and short on the word fest on the screen. Michael Daley's positive ad brought back memories of the opener from the Kevin07 campaign, and was nice work. The Coalition ads were okay at best, the 15 second TVC was short and punchy and probably the stand out.